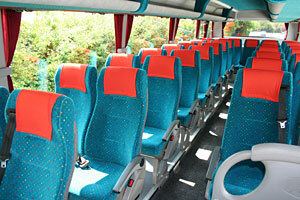 All midi-coaches have "Fainsa" high-backed moquette seats all with fold down arm rests and magazine nets. All seats have ventilation control, individual reading lights and retractable 2 point seat belts. An additional seat is available for a guide. 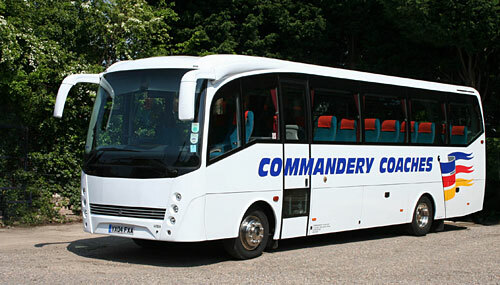 The complete fleet of 35 seat coaches are based on Mercedes running gear with full coach built bodies and have an excellent ride quality on air suspension. Full heating is provided with climate control which warms the interior to normal working temperatures. Air Conditioning is standard. Side draw curtains are present for privacy together with tinted glazing. Carpets are provided to the gangway and entrance steps and a soft trim interior moquett to side walls and roof. F.M. radio/cassette. P.A. System. Hot drinks unit. Power operated door with - wide low level entrance. 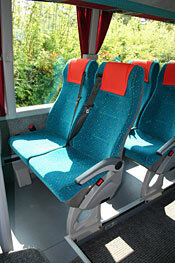 The ample rear luggage hold on these coaches can accommodate approx. 35 average size suit cases, with further space available in 2 side lockers.